The Solid Rock is written in 3/4, but we cannot use a pure 3/4 O/C pattern to play it. Look at the example below, and see all of the chord changes which occur in the middle of the "normal" 3/4 O/C pattern. Fig. 3 shows the first situation in which a pure O/C will not suffice. In this measure, the Chord changes on the last beat of the measure, which is also the last beat of the O/C cycle. While we could just play an F Major chord on the third beat (which would match the necessary chord change), we choose to play an F Octave instead, which will give a firmness to the chord change. Fig. 4 Shows how this is implemented. Look at Fig. 5. In this measure, the chord changes on the second beat of the measure, which is the second beat of the O/C cycle. Since we have two beats to fill with this new chord, we will play the new octave on the second beat, and the new chord on the third beat. Fig. 6 demonstrates this for us. 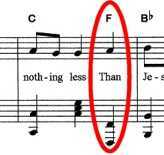 These two patterns occur several times each in this song. Look at the full example below if you have any trouble figuring out how to adapt the O/C for this song. One final note concerning this song: Many churches will hold out certain notes in a hymn, even if it is not marked on the music. To further confuse things, no two churches do this on the same song, on the same note, for the same length of time. 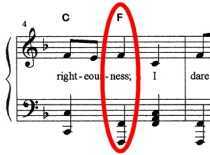 Some hymn publishers try to accommodate these traditions by adding fermatas and even changing the meter for one measure of the song. The best thing for the accompanist to do is to watch out for these situations, and improvise accordingly. In this song, we will simply add beats with our left hand where needed. Later, we will fill in with our right hand as well. Listen to the MIDI example below of The Solid Rock with a few "extra" beats thrown in.